It is seldom if EVER that I have been in a theater where the excitement was so palpable. And, it was probably the youngest theater-going crowd I've seen in YEARS! The voices, the orchestration and the staging were superb! And Clever!! OK - if you are "language and religiously squeamish" you could find it a bit hard to take in some of the numbers, but my face hurt as I drove home from laughing and appreciating the truth of the themes. Spontaneous cheers and ovations await!! 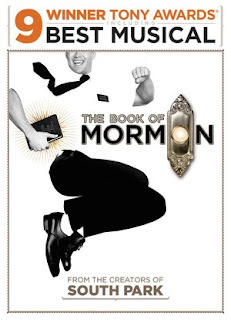 "THE BOOK OF MORMON will conduct a pre-show lottery at the box office, making a limited number of tickets available at $25 apiece; cash only. This lottery will be held prior to every performance except for the gala Opening Night on Wednesday September 12." Back in September, CBS News' "60 Minutes" aired a terrific story which gives insight into the phenomenon that is THE BOOK OF MORMON. Correspondent Steve Kroft talks to Trey Parker and Matt Stone, the creators of Comedy Central's "South Park," who now find themselves having created, along with co-writer Robert Lopez, the biggest hit on Broadway."